Goodreads Synopsis: Not since THE BOOK THIEF has the character of Death played such an original and affecting part in a book for young people. 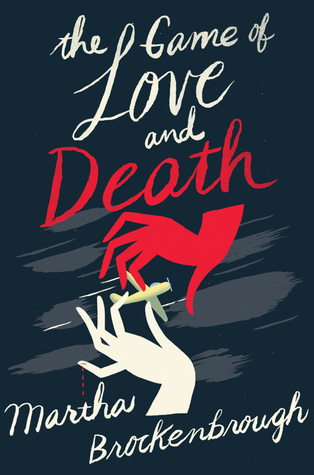 The Game of Love and Death by Martha Brockenbrough was such a hyped up book, honestly every blog I went to either had a review up or had it as their WoW for the week, I knew I had to pick it up! It definitely lived up to my expectations and it turned out to be a beautiful, well-written YA novel. The premise of the book was intriguing, unique, and new. The book begins with Flora and Henry, two lovers, that are drawn together in the game of Love and Death. What makes the book a standout is that Brockenbrough has Death and Love as actual characters and they influence the plot of the book and its characters. I thought that was cool and interesting and made for a more complex novel. Flora, dreams of flying for her whole life, to become the next African American Amalia Earhart and also sings in the jazz clubs at night to support herself. Henry, a young and charismatic character, he is in love with Flora since they were young. I thought both Flora and Henry were great characters, they were easy to relate to and feel for. They each go through their struggles with their emotions and feelings for each other, it was great seeing them come together in the end. The other characters Ethan, Henry's friend was a great addition to the cast of characters, the Thrones were great in providing that eerie and chilly feel to the novel, and Helen, the disguise of Death was just pure creepiness! While the novel had it's golden moments, such as the vivid writing and well-crafted characters, I hate how the chapters were all over the place. You have one from Henry's point of view, then Flora's then both Death and Love, it was just confusing. But towards the end, I did manage to get it. But don't' let that get in the way of you picking up the book! Ultimately, The Game of Love and Death was a book that lived up to my expectations. It was such a interesting concept, anyone would easily love it and the characters made the plot come alive. The book was dark and romantic, and definitely a great read for the summer. Plus, the cover art is honestly amazing, who wouldn't pick it up? !